Today, we're going to look at class cards for Priest and Warlock, and a couple of new neutral cards. Let's see how Anduin gets on in Icecrown, shall we? the sweet release of death. a mind flayer in the art. 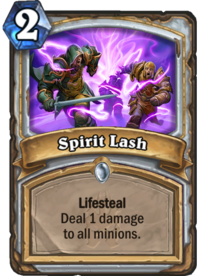 Spirit Lash starts a run of a spell-heavy selection of cards. 2 Mana for an early board clear is all right, comparable to Arcane Explosion. Of course, Arcane Explosion doesn't see much play in Constructed, so what might make this card work? The card damages your own board in exchange for Lifesteal. It can pay off if your opponent is playing a board flood deck (especially one that doesn't run minion buffs), and especially if you throw down, say, Bloodmage Thalnos first. I like this card, but I can't see that it's preferable to using Taunt minions early and then relying on Holy Nova or Dragonfire Potion to clear a hostile board. I rate this card Poor. 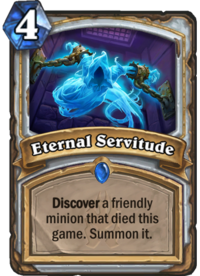 Eternal Servitude adds to priest's resurrection effect toolbox, replacing Resurrect in Standard format. For 2 extra Mana, you gain some control over the minion that gets restored to... life? Undeath? Probably best not to think about it. Unlike Resurrect, which you could often play early after the only minion you'd played previously was Injured Blademaster, Eternal Servitude's cost demands waiting until later in the game, when you've had a chance to play some minions costing 5 or more Mana, or spawned a copy of one with Barnes. This is decent, but not amazing. I give it a Fair rating. Devour Mind is a bigger Thoughtsteal. 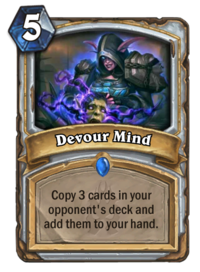 Just like Thoughtsteal was comparable to Arcane Intellect, Devour Mind is comparable to Nourish, both costing 5 Mana to get you 3 cards, albeit from different decks. This style of card is a staple of priest's style of play, but you could often get away with playing Thoughtsteal on curve (except against very fast decks), and you probably won't with Devour Mind. The longer you go before you start copying an opponent's cards, the less value you can potentially get from them. Against aggressive decks that run a low mana curve, this deck also has the potential downside of copying three cards that don't even make up its Mana cost. Overall, I think it's a Poor card. 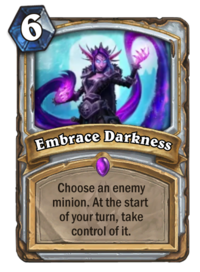 Embrace Darkness is a sort of mini-Mind Control. But the discount in Mana cost comes with a steep price: your opponent has a turn to use the minion you have enchanted before it falls under your control. Your opponent has a chance to Silence the effect, weaken or kill the minion by trading, or even just hit your face with it - and the kind of minions you'd want to play a 6-Mana spell on aren't the kind of minions you want hitting your face most of the time. I personally think this card is Terrible, although I daresay it'll be tried out from time to time - in all fairness, there will be situations that occur in-game where it ends up being a strong play. I just think those situations will be too few and far between to be worthwhile. 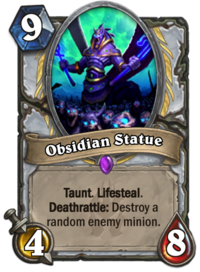 The Obsidian Statue is a big minion with Taunt, Lifesteal, and a powerful Deathrattle. By way of comparison, the 8-Mana Primordial Drake is also a 4/8 minion with Taunt, although it has a board-clearing effect. In a N'Zoth deck, I think Obsidian Statue is powerful. Outside of that, I'm not so sure it's what you want. But I think it's good enough for a Fair rating. 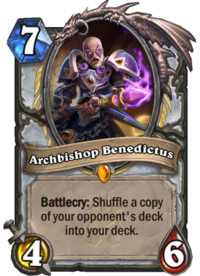 The priest legendary minion, Archbishop Benedictus, is a very appropriate choice for a "Anduin-gone-evil"-style legendary, for he himself was a former priest of the Holy Light turned leader of the Twilight's Hammer cult and ally of Deathwing. His body is a bit small for a 7-Mana minion, so the value of this card depends on his Battlecry - and it's a doozy. Unlike most other priest legendary minions, Benedictus can be played on curve as-is, requiring no other minions on the board to synergise with, or use of spells or your Hero Power to trigger or benefit from his effects. How strong his Battlecry is depends on what kind of deck you are playing against - aggressive decks will provide pretty poor pickings, while midrange and control decks are drool-worthy. Benedictus is an Excellent card. Gul'dan was already a pretty evil character before this whole death knight business, so let's see how he can be evil in new and different ways. I'm getting a vampiric vibe here. 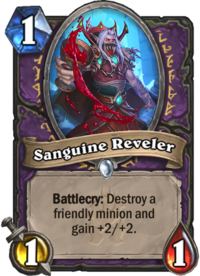 The Sanguine Reveler is, in effect, a 1-Mana 3/3, unless by some mischance you are unable to play it when you have a suitable minion. It works well in decks with minions that you often want to die, or don't mind killing, such as the Devilsaur Egg, Twilight Summoner, Possessed Villager, and, in Wild, the Nerubian Egg. You could also play it on tokens generated from other spells or effects. In Wild, you could even play it on Sylvanas for a cheap way of triggering her Deathrattle. As a 1-Mana card, it's not game-changing, but it is, I reckon, Excellent. 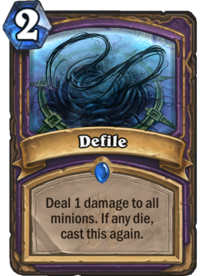 Defile is a spell with a lot of potential. It can easily shut down aggressive boards and, with a little finessing, bigger boards. Just make sure you're using it when you're behind on the board - say, trading your minions to create chains of castings of this spell. With a little creativity, this could end up casting itself multiple times, leaving an empty board onto which you can play some significant threat. Another Excellent card. 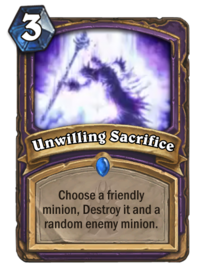 Where Defile looks like an anti-aggressive card, Unwilling Sacrifice looks more like a card you play against control decks. Got a bunch of cheap minions, and don't want to fritter them all away trading with that big beefy Taunt all by itself on the other side of the board? For 3 Mana, just trade one of them. In Wild, this is another potential activator for Sylvanas, providing a big board swing by destroying a minion and taking control of another one. Yet another Excellent card. 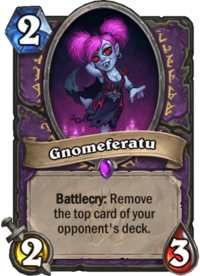 Gnomeferatu is a very interesting 2-Mana minion. It has reasonable stats for its cost, being able to trade with most 1-Mana minions and survive, and has a very interesting mechanic, one that was previously seen (as a downside) of the Fel Reaver. This time, though, you're the one that gets to benefit from it (instead of suffering through burning anywhere from 3-9 cards before your Reaver got hit with Big Game Hunter). 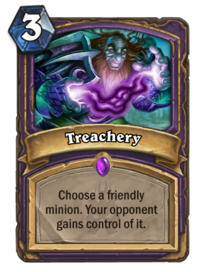 It's not as useful against aggressive decks, who probably won't miss the card it removes that much, you'll feel bad seeing your Grom Hellscream, Lord Jaraxxus, or Tirion Fordring get removed from play. It could be an auto-win against certain kinds of combo decks (a priest combo deck relying on Prophet Velen would be in trouble if Velen gets discarded, for instance). Nevertheless, you're guaranteed some value from Nosferatu's Battlecry, unless by some mischance you cause your opponent to discard a 0-Mana card (or your opponent is out of cards). As such, it's another Excellent card. Treachery feels like more of a dud, however. Outside of the Doomsayer, I can't think of many minions in Standard that you'd want to spend 3 Mana to give to your opponent. That's actually a really strong play: comparable to the 5 Mana a Freeze Mage spends to play Doomsayer with Frost Nova, only better because your opponent doesn't get a turn to try to stop the board clear. (It does have a downside in that your opponent can spend the turn developing the now-cleared board.) That's a strong enough combination all by itself to rescue this card from being abysmal, giving it a Poor rating for being so niche. 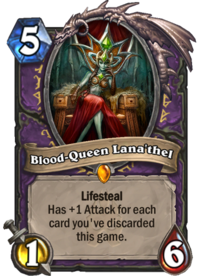 In keeping with the warlock's vampiric theme, Blood-Queen Lana'thel is a Lifesteal minion who fits into discard decks, or even just decks running Doomguard, which plenty of aggressive warlock decks do. As long as she's buffed to at least 3/6, she looks pretty decent for a 5-Mana minion with Lifesteal, though 4/6 is probably optimal. In a discard deck, you can probably play her on curve, which is always good. She also provides healing, which is something that warlock as a class really needs, especially against decks like hunter or mage that can really burn down your Health total. What I don't like about her is that she doesn't fit in decks that don't run discard effects, making her a bit too niche, which as I've written before is disappointing for a class legendary. I think, overall, she's a Fair card. On with a couple more neutral cards to round off the post. 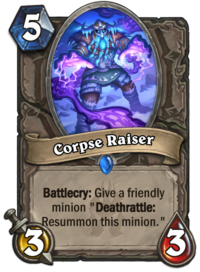 The Corpse Raiser is a neutral minion that has the same effect as the shaman spell Ancestral Spirit, only you get a 3/3 body for 3 more Mana. To be honest, you could make this a 3-Mana card and I'm not sure it would see play except in the greediest of control decks. The reason the spell works is because you can play it with a 7-Mana or 8-Mana minion on turn 9 or 10 (or later). At 5 Mana, you can't play this minion simultaneously except with a 5-cost minion. So it becomes a very slow effect. A really greedy deck might try to find a way to fit this card in, but no one else will. I think it's Terrible. 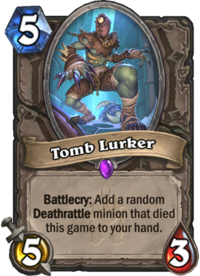 The Tomb Lurker is another card that will probably only see the light of day in a greedy control deck that runs a few high-value Deathrattle minions. But again, it's pretty poor stats for its cost. It has the advantage, over the Corpse Raiser, of being something you can play at any time, once you have played an eligible minion. However, its game plan can be mucked up if your opponent is playing low-cost Deathrattle minions. I just can't justify rating this higher than Terrible. That's it for now! Tomorrow, we're going to look at mage cards, and a smattering of class cards for other classes that were released after I went through those classes in previous posts.